I am so happy it is Monday (who says that right?)! I have been so busy the past few weeks plus had a few weeks without my Lisa as she stayed in Sweden for a few weeks helping out with mom and has an amazing trip report for her return flight to share soon. Anyway, I have a few things to catch you up on in the Delta “world” and some news as well. You can now start your IFE (in-flight entertainment – system) on the ground. My take on this is that while I like this, there have been so many times that Delta reps have to reboot the IFE that it will be interesting to see this implemented. Plus, about 1 out of 10 flights the FA’s don’t have time for a pre-flight drink and this will be just one more task for them to try to get done. Readers all know I love Grand Cayman. Delta with Audience rewards has a chance to win 100,000 Skymiles and more plus earn a few Skymiles. Audience Rewards is a quick way each month to earn 10 Skymiles. Not much, but hey for a few seconds or even in-flight grab a few more, and the answers are posted on FlyerTalk each month by someone! I got to check out the SkyDeck on my Mileage Run last week in the “F” concourse in Atlanta and will cover that this week. My fellow BA blogger PM&M has a good post about a new club I saw just across from the Skyclub. If you have any INK cards you can get 2 free visits via the “Lounge Club“! Speaking of INK, I hope all have noticed you can get up to $500 gift cards with free S&H with your Chase cards for now. They can, with PIN, be loaded to BlueBird at Walmart according to all reports. There is a max of $2500 per 30 days. My favorite award booking guru (Adam – see the E21 post in the Essentials Tab) got to fly Virgin Atlantic upper class and I look forward to his report. 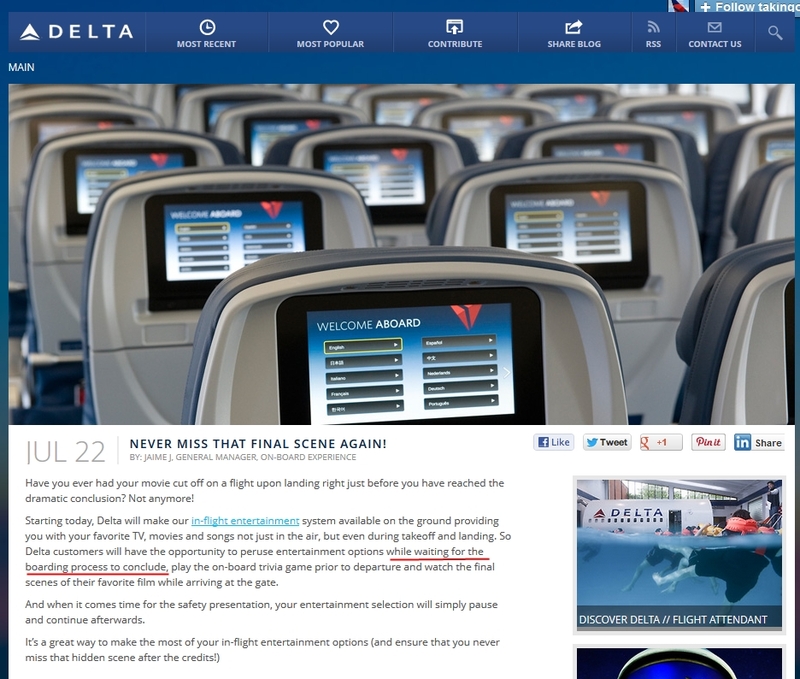 Also know some low level biz seats are starting to load into Delta.com so be on the lookout for flights to try out their products. Delta is getting into the food “reality” show biz it would seem. No, to be fair I love shows like “Chopped” so this could be fun to see. For me, what I really want Delta to do, is improve the food on short morning flights like the 1hr+ ones. I think a muffin and banana are just not fun in business class. On KLM etc. you get a “real” snack. The old old old new account bonus account LINK is still live but I have no idea if you will still get all the points. Would love to get feedback if it is working this year too. World Airline News reports the 717’s will start flying on September 19th for Delta! I cannot wait for Pinnacle Airlines – err – Endeavor Air to dump the CRJ200’s ASAP! AJC.com reports Delta is hiring pilots. They will be pulling from furloughed and regionals. With the new flight hour requirements for starting pilots we are going to see a real pilot shortage on the way over the next few years! I am sure you have seen what gas prices have been doing as of late at the pump. If you think the rise in the price of oil will lead to higher prices soon for Delta tickets then I would agree with you! Sorry but I am never ever going to Peru EVER now. Ewwww! Oh and nor I am ever going to DUBAI (check sound video plays automatically)! ← One reason (of many) never to cancel a points card too soon! thanks for the tip on the Chase cards. makes sense to load up on gift cards now for gifts later this year to my assistant, all the doormen and staff in my building, dry cleaners, etc. Lots of last minute low level award availability to/from Europe this week. Just be careful of anything involving KLM flights because I found 10+ routes with different phantom space showing on Delta.com. @WE – txs yes many times I have to call when that happens but most good reps can conf and grab the space. A friend of mine just signed up for the new acct bonus and will be taking 1st RT flight on Saturday, so we will know soon if bonus miles are posting! @Jon L – LOL yes I think this is just for new SM members! But a good try! Anyone know if buying those Chase gift cards counts toward spend? @Steve – all reports say yes both spend and points (otherwise what would be the point btw).